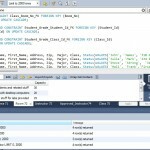 In this assignment, you will learn to create a MySQL database from a given ERD. To complete this assignment, you will need to be able to run MySQL via Omnymbus. 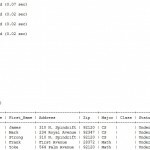 Please ensure that you can connect to MySQL/Omnymbus via the account your Professor has e-mailed to you. Please consult with the document titled MySQLOmnymbusSupport.docx located in the Doc Sharing folder titled Omnymbus Tutorial Files for instructions on how to get help for any issues that you are having with the MySQL/Omnymbus Environment. SQL script file named LastName_Lab3.sql. Word document named LastName_Lab3_Output. When you are done, zip up these files and submit them to the Week 5: iLab Dropbox. •	To reference, learn and apply MySQL’s own dialect of the SQL language to this iLab, browse through the file M10C_KROE8352_13_SE_WC10C.pdf in the Doc Sharing folder titled My SQL Documents. •	Create a script file named LastName_Lab3.sql containing SQL statements created in Steps 3–7 below. 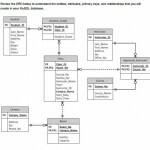 •	Add a table for each entity listed in the provided ERD diagram. •	Add a column for each attribute listed in the provided ERD diagram. •	Select primary key for each table as indicated in the provided ERD diagram. 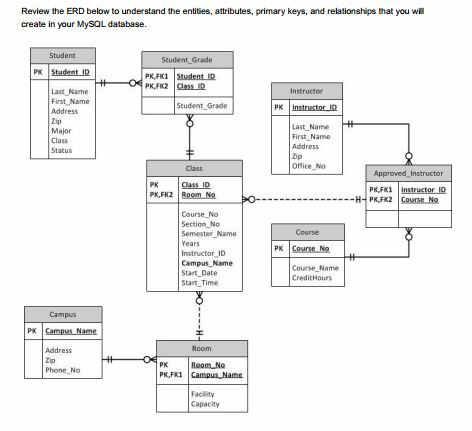 •	Identify foreign key relationship between tables as indicated in the provided ERD diagram. •	Enable referential integrity on the relationship. 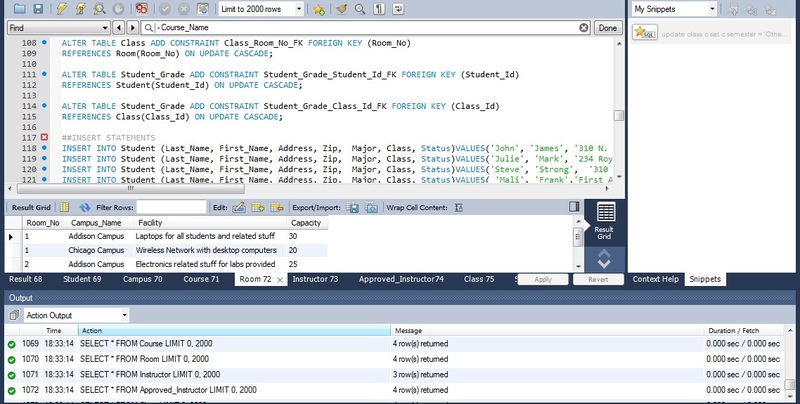 •	Enable cascade updates on the relationship. •	Dates should have a date data type. •	Surrogate keys should be auto-numbered. •	Numeric data should have a numeric data type. •	Character data should have a character data type. •	Student first and last name cannot be a null value. •	Course credit hours must be between one and four. •	Course name must be unique and cannot be a null value. •	Instructor first and last name cannot be a null value. •	Grade must be one of these values: A, B, C, D, F, I, W, or E. W signifies withdrawn and E signifies enrolled. •	Include a COMMIT command at the end of the script. •	Include SHOW TABLES command at the end of the script, to show all tables created. •	Include SELECT statements for each table at the end of the script, to show data inserted. •	Paste a copy of the output in a MS Word document named LastName_Lab3_Output. 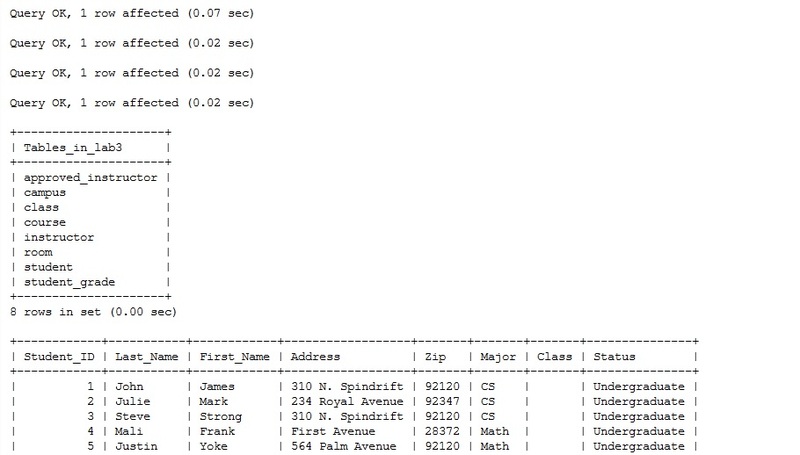 o	Dates should have a date data type. o	Surrogate keys should be autonumbered. o	Numeric data should have a numeric data type. o	Character data should have a character data type. o	Relationships enabled for cascade updates. o	Student name cannot be set to null. o	Course credit hours are restricted to between one and four. o	Course name must be unique and cannot be set to null. o	Instructor last name and first name cannot be set to null. o	Grade is restricted to be one of these values: A, B, C, D, F, I, W, or E (enrolled).